The latest news from Miriam Cain at Camper & Nicholsons is that Michael Payne in the Monaco office has listed Pershing's 27.5m motor MM yacht for sale. Delivered in 2008, she's one of the most striking Pershings afloat. Her high ceilings combine with a stunning interior and a silver exterior profile to create a unique superyacht. 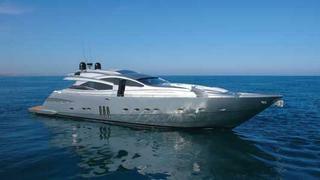 With her fibreglass hull and twin 2,435hp MTU engines, she has a cruising speed of 38 knots. Accommodating eight guests, MM is asking €5.5 million.